What are you up to these school holidays? Why not map out your ideas for your Fanfare? 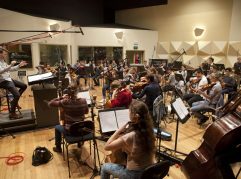 The Fanfare Competition is open to young people aged 12-21 years to write a short 30 second composition to assist calling people to take their seats at venues across Australia. 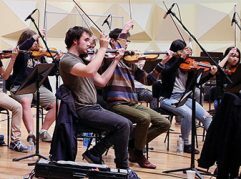 Each year eight selected participants work with professional mentor composers Nicholas Vines and Lyle Chan to develop their ideas and have their works recorded by the Australian Youth Orchestra (AYO). 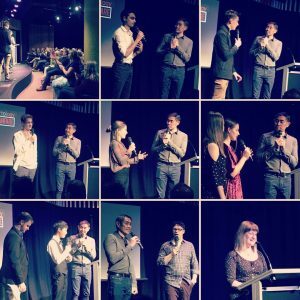 Families, friends, colleagues, school principals and teachers joined us for the launch of the 2017-18 fanfares at The Channel, Arts Centre Melbourne, Monday 5 March 2018. 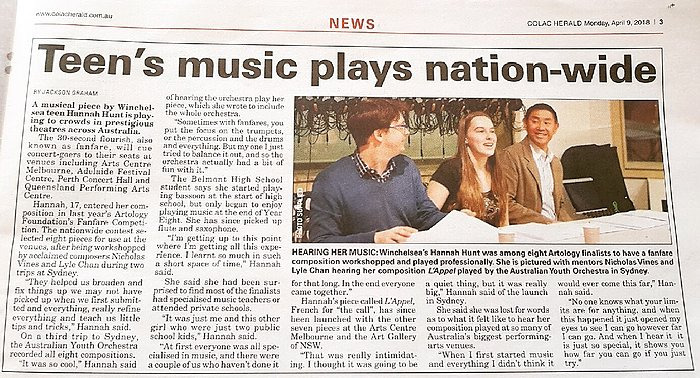 Earlier in the month we heard fanfares by Ronan Apcar and Hannah Hunt played at the Art Gallery of NSW, Resonate Series. 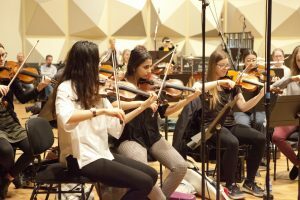 Fanfare also featured as part of the 2018 Perth Festival and you can hear the four young composers’ works online, here. Fanfare’s are broadcast at Adelaide Festival Centre, Arts Centre Melbourne, Art Gallery Society of NSW, Perth Concert Hall and Queensland Performing Arts Centre. 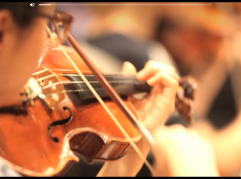 Have you had a look at our FREE composition lesson plans! 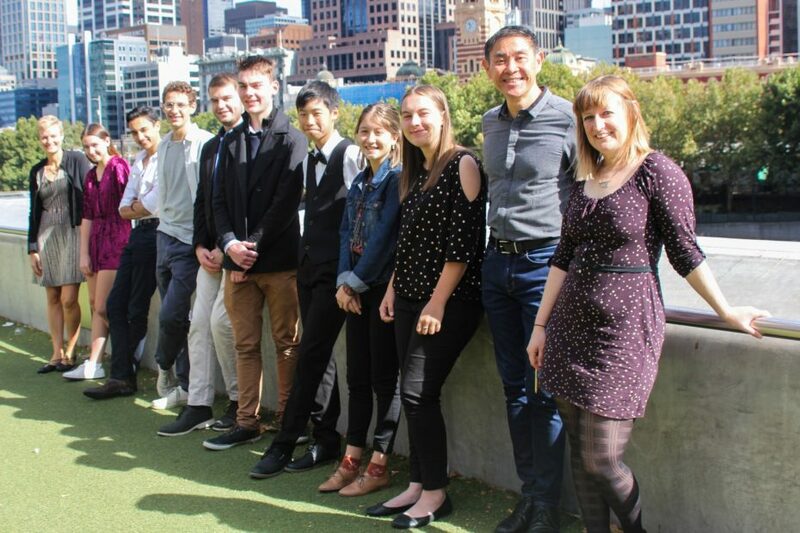 Artology in partnership with Cool Australia have created FREE Teaching Resources to compliment classroom learning in support of the competition. 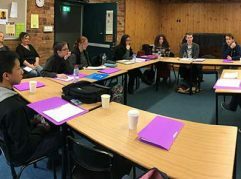 Each lesson is mapped to the Australian Curriculum, provides a clear and practical teaching approach, including comprehensive teacher advice. New this year are activities on Orchestrating. There’s also a Student DIY Guide that breaks down the composition process with short activities and allows students to work independently on their compositions. 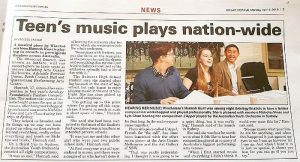 As part of Fanfare, one lucky participate is selected to be mentored in sound design by Steve Francis for an Australian Theatre for Young People production. Contact us if you’d like a free poster for your classroom or foyer.